At Comex close the SILVER PRICE had added 11.6¢ (0.8%) to $14.836. The GOLD PRICE gobbled up $16.30 (1.4%) for a $1,157.60 close. Markets are very jumpy, all of ’em. At 10 a.m. Eastern time the gold price gapped from $1,150 to $1,155, a gap I find no explanation for. Gapped again from $1,155 to $1,157 about 2:45. Silver gapped, too, but not as strongly. First jumped from $14.85 to $14.90, second from $14.88 to $14.90. Nervous, very nervous. The GOLD PRICE appears headed for $1,192, the last (October) high. That’s a first and minimum target. 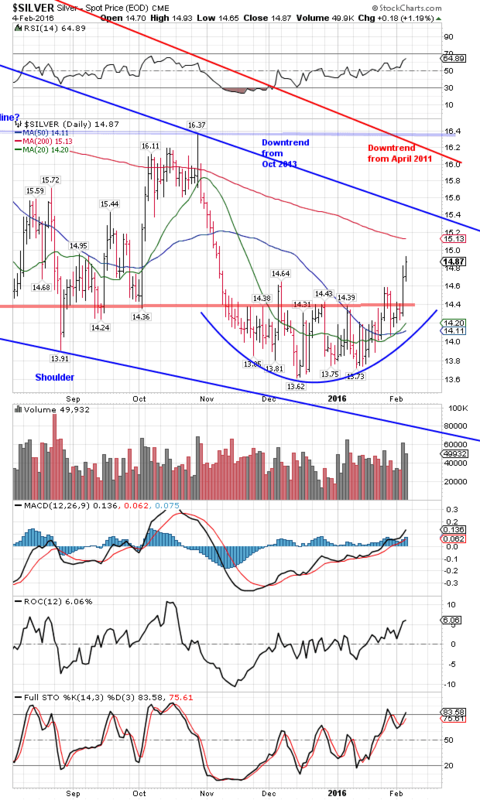 I’m reining myself in, not getting too excited because I expect lots of up and down this year as silver and gold prices build a base for the next big advance. The price of gold still needs to cross $1,162, three percent above the $1,128 breakout, for proof. Passing that old $1,192 high will sooth my nerves, too, because the gold price has punched through its 200 DMA before, several times in the last twelve months, without following through. Here’s an 11-month chart, strong lately as a garlic milkshake. Silver ain’t nearly as pert and lively as gold, and that sits as a burr under my saddle. Also, volume for silver and gold dropped way, way off today. Need more buyers to fuel a rally. 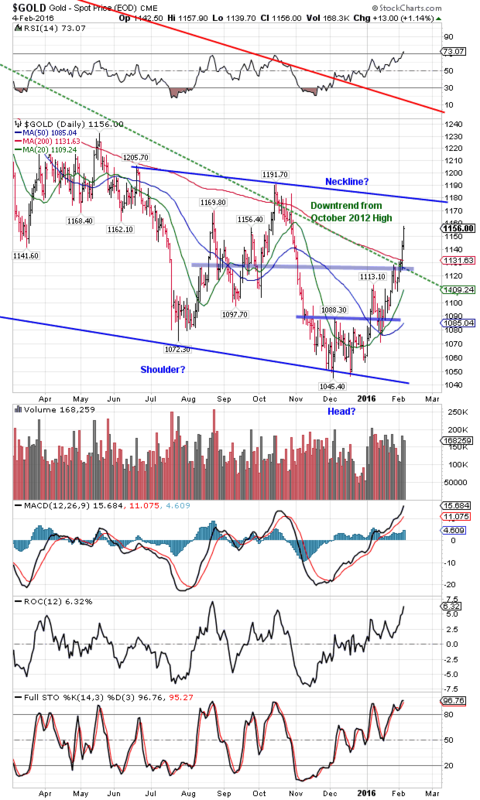 Gold has pierced its 200 DMA, now silver needs to follow suit and push through $15.13. High today was $14.95, fifteen cents away. Platinum and palladium are confirming silver and gold’s rise. Platinum’s 8-month chart on the right, boasts a bullish falling wedge that began in July. 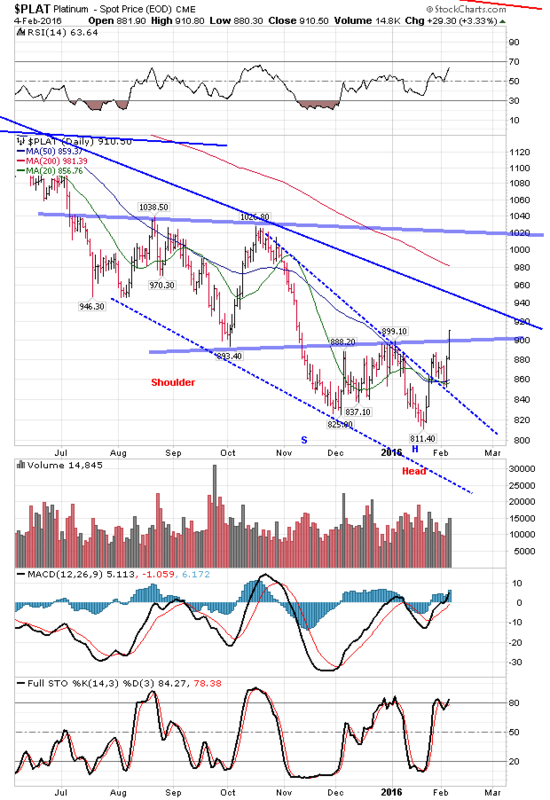 Platinum broke out upside in January, touched back to the breakout point (upper wedge boundary), then soared. Today it rose another $25.60 to $904.40, over $900 again. Has added over $50 in last 2 days. 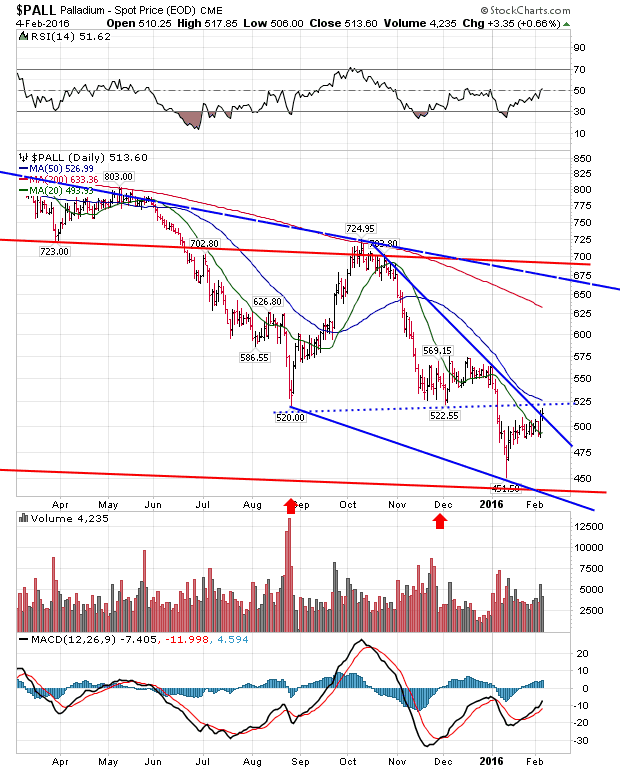 Palladium’s chart isn’t as juicy, It also shows a falling wedge with a bare minimal breakout. Palladium needs to confirm by moving from today’s $516.80 close above its 50 DMA at $527. Other inflation markets are also rising. 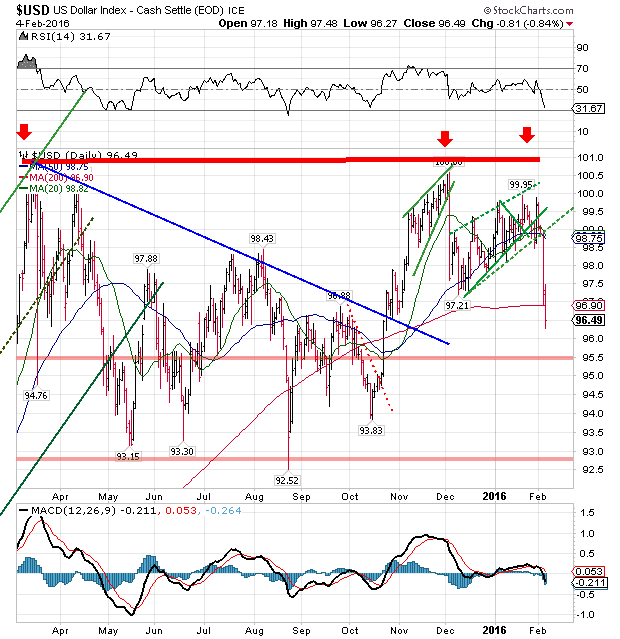 WTIC oil rose nearly 2% to $33.38, but needs to cross $34.82 to prove a reversal, even short term. Copper rose 1.525 to $1.23, and has climbed back into the channel it fell from in January. Also completing a widening wedge that usually resolves skyward. All systems are go for silver and gold prices, I am just watching on the porch, looking for more rally confirmations. Most eye-catching about that big US dollar index drop yesterday is that no special trigger set it off, only several minor news events that took it to the channel boundary and then through and for a panic dive. Likely triggered by spreading realization the Fed can’t raise interest rates with every other major central bank going negative — in spite of Fed jawboning to the contrary. If the Fed continues raising rates now, they will dislocate every joint in the US economy. Dollar index kept on cascading today, tumbling another 74 basis points (0.76%) over the rocks to 96.56. That teaseth the 96.50 support/resistance, plus plunges the Dollar Index below its 200 day moving average, and not by a little: 200 now stands at 96.90. Second day of decline implies the Nice Government Men are holding back, i.e., this may be a deliberate move by the Fed. A falling dollar is, of course, the best fuel for a gold and silver rally, so this nat’ral born durned fool from Tennessee is not complaining. Thanks to all y’all who prayed for Susan. She has improved today but her eye is still hurting. For Miss High Pain Tolerance to say that, it must be smarting, but she is some kind of brave. Thanks in advance for continuing to pray for her.